Harper can now dress herself fully - pulling a shirt over her head in the correct direction was the last hurdle - and prefers to choose her own clothes. I say AWESOME! Sometimes the results are striking. Here are some samples with my best Project Runway critique. This ensemble is quite nice, though at first I thought pink and orange might be a bit much. But the pink of the leggings plays off the pink in the t-shirt. The shoes seem a bit formal for the look, but still within the color scheme. There is a lot going on here. Spiderman AND Hello Kitty together? Not sure about that. But Nina might say it's a very editorial look. Heidi might say it's very Japanese street fashion. The next one is a dress I got Harper in Hawaii last year. It finally fits so I put it on her and she liked it. For five minutes. Then she went about restyling it to make it her own. I love pop culture. I LOVE IT! I don't have religion, I have the movies and tv. Sunday morning movies are the best. 10am popcorn? Yes please! Trailers that last for fifteen minutes before the movie? Why not twenty? I could watch two hours of trailers. And these days with Television? OMG don't get me started on the amazing stories being told out there. Where was I? oh yes, Nerd. I love joining up with the Who Universe to feel connected, to be part of a larger group. I think I had a bit of disconnect from the "larger group" when I was a kid and am always looking for it. I was the youngest and my next oldest sibling was five years older. We did plenty of stuff together, but there was also lots of earlier bedtimes and "maybe when you are older." And growing up haole in Hawaii creates an intense disconnect. It's challenging as I feel 100% connected to Hawaii, yet at the same time could never quite fit in. In my K-8 elementary school, I was one of about 15 haoles out of 650 students. I had friends, but they were just school friends as I got on a bus every day to go home. And on that bus I read. I was a reader from an early age and my mom indulged me with books all the time. (Yay Mom! I do and will continue to do the same with Harper.) Someone gave me the first two Little House books when I was eight and I got HOOKED. Here was a story about a girl my age and her family in a world that was totally alien to me. Prairie? Snow? Churning butter? I didn't know anyone else who had read these books. Or who was obsessed with the way I was. I asked mom to make me a sunbonnet. And she did. AND I WORE IT! I didn't wear it on my head. No no. I wore it hanging down my back, as Laura had. Haven't you read the books?? (and yes, I still have it.) I was a community of one, and I let my freak flag fly, even though I'm sure 100% of the people who saw me were like "what is that thing around your neck?" Side note: prairie fashions were IN in the early 80's. I wore an outfit regularly that was not dissimilar to this one, complete with the sunbonnet accessory. I loved my denim skirt. Mom also made me a petticoat to go with it. LOVED LOVED LOVED. Where was I? Oh yes, dearth of Laura fans on Maui. Now you can connect with other Laura Fans, read more about her life, see pictures of her and even visit some of the little houses. Or you can have a Doctor Who ring tone on your phone (guilty! ), or a tiny tardis necklace and people will nod and smile, knowingly. Or they'll argue with you about Russel T Davis vs. Steven Moffat. (or Tennant vs. Smith). It's wonderful to make those tiny yet meaningful connections in any group. We are a community! I'm not a church goer but I made a pilgrimage in 1998 to worship at the Church of Laura. I have stood in line to receive the good word of Obi Wan Kenobi multiple times (before and after the re releases). 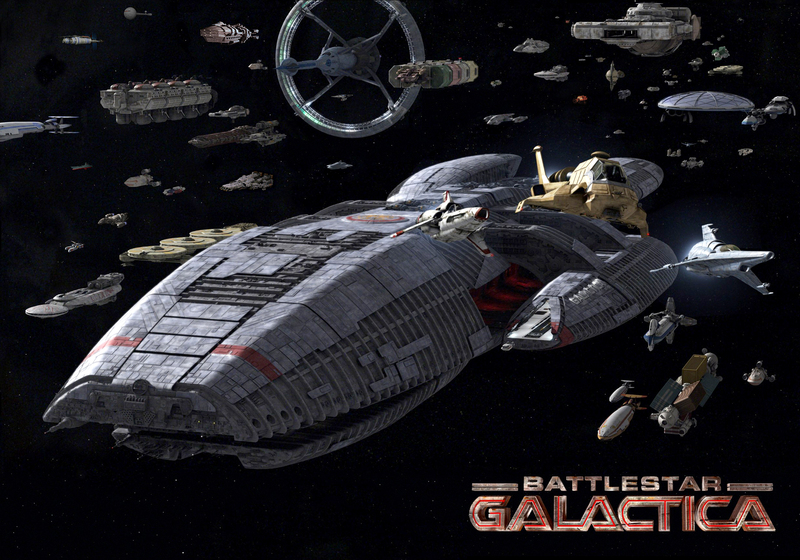 I've gotten to live long enough to be obsessed with BOTH versions of Battlestar Galactica and have loved them equally. Curiosity makes all the difference. Learning about new things, new ideas, new characters, history, art, language, that is all amazing to me. I've always loved reading and writing stories. If you are open to new things, willing to give something a try (not just one episode, come on!) then the world will always be rich and full. People might say pop-culture is just junk. But oh I disagree. There can be so much commentary, so much reflection on the bigger things in the world, all hidden within that "junk." When our BSG heroes landed on New Caprica, rebuilt their lives, then (spoilers) the Cylons came and took over, there was a lot of excellent commentary on the Iraq war. They made you really look at both sides of a conflict and sympathize with those you might think are the bad guys. Powerful stuff. And when things are well written, well created, there can be such delightful surprises. You watch a show thinking, Oh this and that will happen and NOTHING CLOSE to it happens. The Good Wife is excellent at this. So is Justified. (OMG Justified, you guys, please watch that show it's amazeballs.) Did you read Gone Girl? That point in the middle where it all went in a TOTALLY different direction? Awesome. I aspire to write that well. I aspire every day and mostly fail, but dammit, I keep trying. Why did I start this conversation? Because I'm a newly minted Whovian at age 47 and I'm wearing my fandom on my sleeve. I want a Tardis in my backyard. (Or in my house were the house big enough.) In a weird way I'm proud of myself for diving into something new and going whole hog. I always want to try new things. I hope I'm bingeing on something cool when I'm 87. Oh and if I could afford a bespoke version of this I would totally wear it. I'm a goner, people, do you understand? Done. I have fully succumbed to Doctor Who and can't wait to see where it goes from here. You might have zero interest in pop-culture. Fine. But go out and be curious! Read, travel, explore, taste, try! And don't be afraid to let it show. I have become a Whovian. Well... most true Whovians might say I'm a Julia-come-lately and that I'm not a true Who Fan because I only started with the 9th Doctor, not the entire show from the 60's. That's fair. But I had to start somewhere! Honestly, I couldn't stand not knowing what all the wacky references were on the internets. I kept seeing things about Daleks (costumes, birthday cakes, silly hats, people saying "exterminate!" in funny voices) but didn't know what they meant. Same for the Tardis. And Sonic Screwdrivers and Weeping Angels and Cassandra. And on and on. I thought I knew a thing or two about some pop culture sci-fi stuff, but I had missed this whole side of the world and felt it was time to get on board. Thanks to Netflix, it was easy to drink the kool-aid and step into the Tardis. In the precious few moments between Harper going to bed and me going to bed (it's a very small window as I'm such an early to be/early to rise kind of person) I like to watch a bit of mindless tv. And Doctor Who has filled that bill for me over the last few months. I understood going in that there is a giant machine of fandom behind this show and that I couldn't hope to grasp it all in just a few weeks or months. I also understood that Doctor Who is mainly a show for a younger audience. It's on during family time on Saturday nights. It's a bit goofy. It can be scary but not bloody or violent. I think it's wonderful. Yes, there are new books and movies and series coming out now that people are huge fans of and they do get the experience of the waiting, the anticipation. These are good things. The waiting is what creates the deep fan experience. But with bingeing, there is the loss of that experience. Or it is squeezed into days (or hours in some cases) and can't, therefore, be as rich. The beauty of today, 2014, is that a) we can binge on shows and b) there is so much to read out there online. While I don't have the years of investment in Who that others have, I can certainly read and watch and enjoy all kinds of Who related things and feel a part of this community right away. There will be those in the community who might think me a Doctor Who Dilettante (A Wholettante?) but that's okay, there are always those kinds... I have enough respect for the show, the world of Doctore Who to at least not be this. In Part Two, I will explore the curiosity factor and how it should never stop being a part of your life. Oh and Nerds. And also letting your freak flag fly! Treme, the drama on HBO about New Orleans after Katrina has ended. The last episode aired on December 29, 2013, but I only watched the last two about a week ago. I just couldn't let it go. I fell in love with all these amazing characters and places and cultures. When I watched, I always thought about how I would feel living in NO and realized that on some levels, it would be like living in Hawaii. There is a very public version of the place that all the tourists come to and enjoy. But underneath all that there is the true soul and long history of the place that you might only know having been born and grown up there or maybe if you lived there for decades and truly opened yourself up in a humble manner to take it all in. Having grown up in Hawaii, I know I could never call myself a true "local" in a place like NO, even if I lived there for 25 years. There is something deep and spiritual in places like this that you can't just read about, show up for a few years and "know." Treme made me miss living in Hawaii. I often wonder if I could move back home to live. When people ask me, I usually say "I could have a house there, but I couldn't live there full time." I think that is still true because while a deep part of my heart will always be in Hawaii, always, and my ashes will be scattered there someday far in the future, I am too restless to stay. I love LA, I love the bustle and the bigness and the always present opportunity to go somewhere (without the five extra hours from HNL to LAX). But back to Treme. I'm going to miss you. I'm going to miss Big Chief Lambreaux and his hard commitment. I'm going to miss Antoine and his laid back style. I never got to eat at Desautel's or to meet Miss LaDonna and have a drink at Gigi's. I would like to. So long Treme, I'm going to miss you!